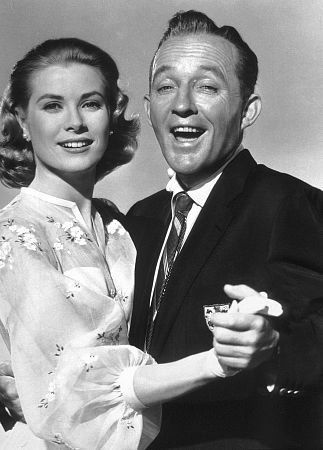 Today's song is True Love performed by Bing Crosby and Grace Kelly in High Society (1956). Composer Cole Porter is renowned for his witty lyrics and sophisticated melodies, but one of his best songs is a simple waltz performed by two newlyweds. Porter wrote True Love for the MGM musical High Society (1956), which was a remake of the classic romantic comedy The Philadelphia Story (1940). Both movies tells the story of wealthy heiress Tracy Lord (Grace Kelly), whose high profile divorce from her first husband, Dexter Haven (Bing Crosby), has attracted plenty of tabloid headlines. While both films center around the fraught relationship between Tracy and Dexter Haven, only High Society has flashback scenes to the couple's married life. Grace Kelly and Bing Crosby in a publicity still for High Society (1956). Crosby, with a little help from Kelly on the final chorus, performs the song while the newlyweds are honeymooning on Dexter Haven's yacht, which is also named the True Love. Crosby plays the concertina and sings the simple, but beautiful lyrics while the couple enjoys a nautical sunset (clip above). High Society includes several great Porter songs, including the calypso-inspired "High Society" performed by Louis Armstrong and his band, and Crosby and Frank Sinatra's crackling duet to "Well, Did You Evah?" (Porter actually reworked this song from an earlier musical, DuBarry Was a Lady), but even among those great numbers, True Love stands out for its simple loveliness. Many, including music publisher Max Dreyfus, ranked True Love among Porter's best songs, according to The Songs of Hollywood by Philip Furia and Laurie Patterson. "In all my 60-odd years of music publishing, nothing has given me more personal pleasure and gratification than the extraordinary success of True Love," Dreyfus wrote to Porter. " It is truly a simple, beautiful, tasteful composition worthy of Franz Schubert." True Love was a huge hit in 1956, reaching No. 4 on the charts, and it became the only gold record of Kelly's career. True Love was nominated for best original song at the Academy Awards, but it lost to "Que Sera, Sera (Whatever Will Be, Will Be)" from The Man Who Knew Too Much (1956). There was also a hit version by Jane Powell released at the same time (clip below). Since 1956, True Love has remained a popular standard. It has been recorded by Elvis Presley, Patsy Cline, Ricky Nelson, Elton John, and Neil Diamond. Even former Beatle George Harrison released a popular version in 1977 (clip below). For more old Hollywood love songs, go here.